DES MOINES – Gov. Terry E. Branstad, Lt. Gov. 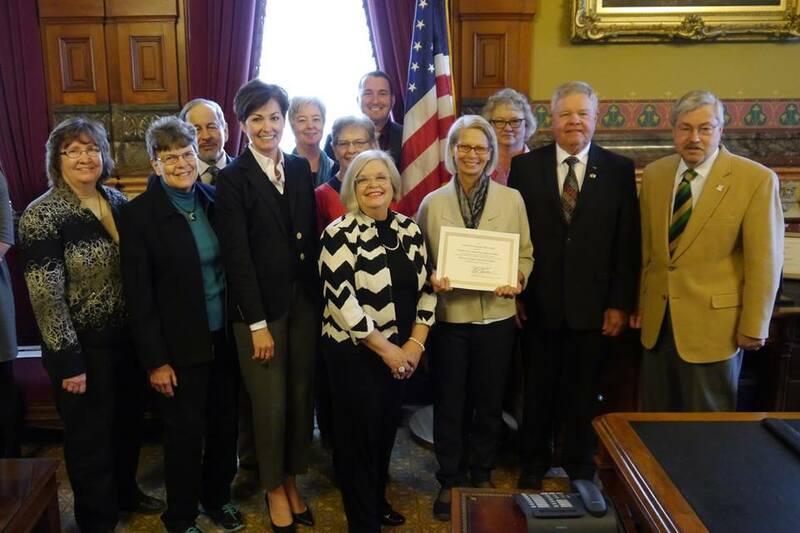 Kim Reynolds and John Brown of the State Historical Society of Iowa Board of Trustees presented this year’s “Awards for Excellence in History” this week at the State Capitol in Des Moines. Through the awards program, the State Historical Society of Iowa Board of Trustees recognizes individuals, organizations and communities who made outstanding contributions last year to the study and practice of Iowa history. This award is named in honor of Loren Horton, who represented the State Historical Society of Iowa in many capacities from 1973 until his retirement in 1996. As SHSI’s field services coordinator and senior historian, Horton’s work brought him in close contact with many local historical organizations. In keeping with that legacy, this award recognizes the best project that increases awareness and participation in Iowa history on a local level. The award recognizes an individual, group, or organization whose outstanding local history project was completed during the previous calendar year.